Get 100% up to £300! Editors note: William Hill are offering all new casino customers a 100% deposit bonus up to a max of £300 (which is a good size when compared to the majority of online casino sites). The min deposit to claim a bonus is just £10 and if you deposit £300 you’ll get the full £300 bonus on offer so you’ll have a decent start on the site… they’re also a well trusted casino with a great rep for payouts so definitely worth a shot. Amongst the 200 plus slots options, punters can choose between more traditional style games, more modern video slots and even more besides. There are, in fact, around 20 different progressive jackpot slots to choose from too. Some of the most popular of the slot games provided by the William Hill Casino include Frankie Dettori’s Magic Seven and a whole host of games themed around different Marvel superheroes and comic book characters. Play slots at William Hill & get your 100% up to £300 bonus! New William Hill customers can benefit from an interesting and a generous welcome promotion. That promotion provides an initial 100% matched deposit bonus up to a maximum of £300. Visit casino.williamhill.com on your PC, laptop or mobile device. Select the green ‘Join’ button found toward the top right hand corner of the home page and a registration form will pop up. Fill in that registration form with the requested information and then click or tap the green ‘Create My Account’ button. Opt in to the promo. Deposit at least £10 to your new William Hill account and bonus funds worth exactly 100% of that deposit will then also be available to you the next time you access a casino game (up to £300 max). Get your 100% up to £300 bonus! The welcome promotion is available only to brand new William Hill customers registering for their first ever William Hill account. That bonus remains valid for 7 days and if it has not been claimed it will expire. Before withdrawal of the bonus or any related winnings is possible, the bonus amount must be wagered at least 40 times (i.e. £350 must be wagered). If any withdrawal is attempted before the above requirements are met, the bonus is void and bonus funds and related winnings will be removed. All games count towards the wagering requirements for the bonus but are not equally weighted. Wagering requirement contributions are as follows; slot games (excluding Football Rules, Wild Gambler and Wild Gambler 2: Arctic Adventure) and scratch cards contribute 100%; Pai Gow, Red Dog, Let it Ride, Football Rules, Wild Gambler and Wild Gambler 2: Arctic Adventure contribute 25%; baccarat, Stravaganza, craps, sic Bo, multi spin slots and blackjack (excluding Blackjack Switch & Pontoon) contribute 20%; video poker, blackjack switch, pontoon, Casino War and Lucky Wheel contribute 5%; roulette contributes between 0% and 50% dependent on wagering. To qualify for the 100% matched deposit bonus, a customer’s first William Hill deposit must be worth more than £10. 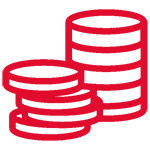 The maximum bonus amount is capped at £300. After the bonus is credited, an amount equal to 40 times the initial deposit AND bonus amount must be wagered before a withdrawal is allowed. The bonus remains valid for seven days, after which time any bonus funds and related winnings will be forfeit if the wagering requirements have not been fulfilled. The bonus is invalidated if a withdrawal is attempted before the above requirements have been fulfilled. Terms and conditions apply, see William Hill casino for dull details. Players who like to access their favourite casino games on the move will be pleased to hear that William Hill have long provided a mobile version of their service. The company have largely gone down the web browser route with their mobile offering, making their service fully usable by simply accessing their site on any mobile device. There is, however, also a downloadable app for iOS controlled phones and tablets. The fact that the William Hill casino utilises HTML5 means that it can be fully accessed and used without any download being necessary. This is a big plus for those who may want to quickly and easily play a game simply to pass the time and those whose mobile device is a little short on storage space. That’s by no means the only positive feature of the William Hill mobile app, however, as it also impresses in terms of the variety of games available and in the realm of promotions and bonuses. A vast collection of different types of game are accessible via any mobile device and even include around 20 different progressive jackpot slot games. All of the promotions and offers available to desktop customers, too, are also extended to those punters who line to play on the move. Whilst the selection of games which are playable through the William Hill mobile app is generally impressive, it is a little disappointing that it falls quite far short of the overall number of games available through their desktop site. What’s more, the William Hill Casino mobile site can also sometimes be a little slow and unresponsive, especially if being run on a slightly slower internet connection. This can be quite frustrating but is, in general, a small niggle rather than a full blown problem with the service. Get app & 100% up to £300 bonus! A good place to begin when assessing any online casino is with the service provided by way of customer support. Fortunately, the William Hill Casino has most bases covered in this regard and offers punters a plethora of different options to explore when it comes to seeking answers to questions or solutions to problems. Any customer’s first port of call is likely to be William Hill’s online help centre that is easily accessible through their site and which caters for their sportsbook and poker customers as well as casino game players. That help centre features a large number of help articles, how to guides and FAQs covering all manner of issues including registration, account queries, payment issues, promotional details and many more besides. All of those pages and answers, too, can be quickly and easily searched thanks to the help centre’s keyword search tool. If an answer to any query or issue is not forthcoming through use of the help centre, William Hill also provide a variety of other customer support avenues that punters can explore. An online live chat feature is available through their site 24 hours a day and seven days a week, and email enquiries can be sent directly through the site too. Freephone helplines, furthermore, are also advertised by William Hill for an array of different countries and enquiries can even be sent by post to the following address; Customer Services, William Hill Online, 6/1 Waterport Place, Gibraltar. The William Hill Casino is operated by a company called WHG (International) Limited, which is registered in Gibraltar at 6/1 Waterport Place. The company is licensed by the Gibraltar government and regulated by the Gibraltar Gaming Commission for all customers residing outside of the UK. For punters located in the UK, meanwhile, the company is licensed and regulated by the Great Britain Gambling Commission. No matter where they are in the world, all William Hill Casino customers can be assured of the security of their transactions and personal data. That’s because the William Hill site possesses a Thawte Security Certificate which determines that all information transferred through the site is encrypted to an industry leading standard. The all-round service offered by William Hill Casino to punters is an unquestionably impressive one. From their welcome bonus, through their choice of games and all the way to their mobile offering, William Hill Casino compares well with the services offered by the company’s major rivals. By providing a potential total of £300 in bonus funds, William Hill’s welcome bonus rates as arguably one of the most generous on the market. It is, however, subject to a number of restrictions and limitations but these aren’t more numerous than those associated with any other similar offer. The number of games provided by the William Hill Casino, too, stacks up well against what is offered by other providers but it is a little disappointing that the variety does go down considerably for mobile customers.